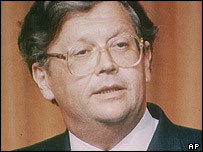 Former New Zealand Prime Minister David Lange has died at the age of 63. He led the country's Labour government for five years from 1984, clashing with the US over his introduction of a nuclear ban in 1985. He died in an Auckland hospital on Saturday, after battling for many years with severe health problems. "It is with sadness that we announce the passing of The Right Hon David Lange," his family said in a statement reported by the NZ Press Association. "Mr Lange died from the complications of renal failure with his close family by his side." A former Methodist lay preacher, Mr Lange led New Zealand through some of its most turbulent years. In 1985, to the anger of then-US President Ronald Reagan and other leaders, he banned nuclear-powered vessels from New Zealand's waters and nuclear arms from its territory. The ban is still in force, to the disquiet of Washington. He also attacked France over its nuclear tests in the South Pacific, and over its sinking of Greenpeace's Rainbow Warrior vessel in Auckland harbour in 1985. An economic reformer, Mr Lange was forced from office in 1989 in a row within his own party over some of his controversial changes, which were aimed at modernising New Zealand's economy. He had been a member of parliament since 1977. He leaves a wife and young daughter, and three children from his first marriage.